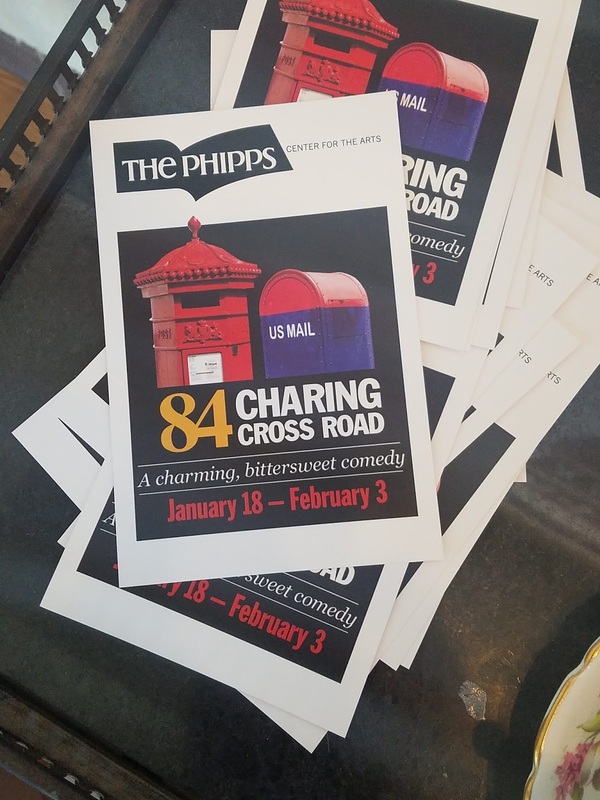 Last weekend, we crossed the river to beautiful Hudson to see 84 Charing Cross Road at the Phipps Center for the Arts, which runs through February 3rd. 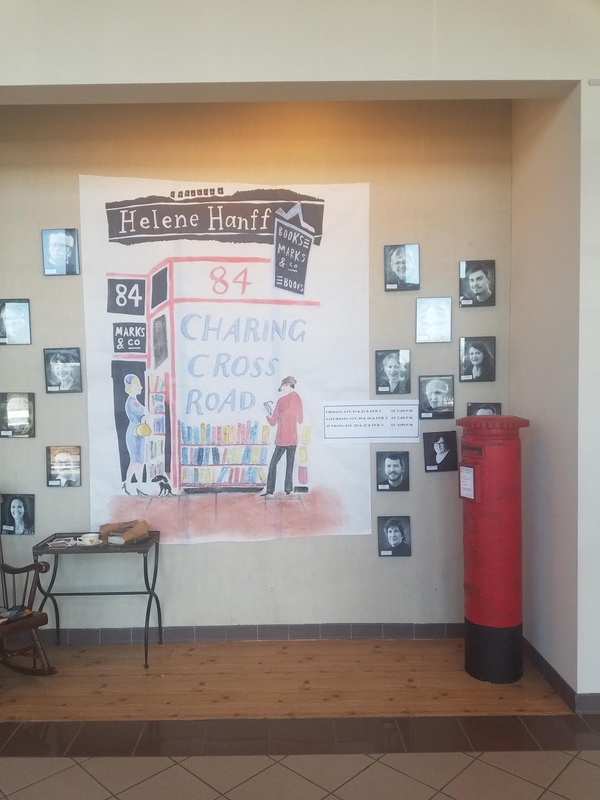 Helene Hanff's charming book about her epistolary exchange with a London bookseller is one of our favorites and we were excited to see it on stage. 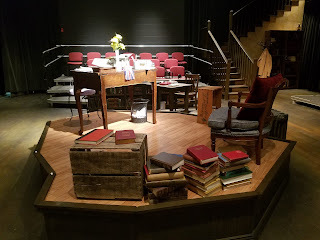 Confession: As a librarian, former bookstore employee and all around fan of books, I've always cast a pretty critical eye at the books that are used as props in theater. And I get it! Sometimes you just have to fill a bookshelf on set with Readers' Digest Condensed books. From the first step through the doorway of Marks & Co (aka the black box theater with a scenic design by Mark Koski), it was clear that this production was going to honor the source material's love of books. But it wasn't just bookshelves filled with legit antiquarian books--this dedication to creating an authentic environment extended to finding the actual books mentioned in the play and reproducing the letters. 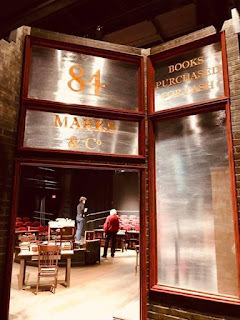 We could not leave the theater without taking a closer look at the beautiful props and chatted with the props person, Heather Edwards. She put so much care, attention and love into the props for this show, we wanted to highlight her beautiful work. By the way, this is a wonderful production of this play. I was in the middle of doing props for Sister Act at the Phipps when I learned they were doing 84, Charing Cross Road based on the book written by Helene Hanff. The book depicts the true 20-plus year correspondence between Helene, a New York writer, and Frank Doel, a London bookseller working at a shop located, not surprisingly, at 84, Charing Cross Road. 84, Charing Cross Road is my favorite book, and it’s a book for which I have great enthusiasm. And so, although the production staff for this show had already been chosen, I begged everyone who would listen that they simply had to let me volunteer. “I’ll just do the books and the letters,” I begged. There are many book titles specifically mentioned in the script, and I was determined to find (some may say, ‘was obsessed with finding’) copies of these books as they were published during the play’s time frame. This ended up being a challenge for a number of reasons. 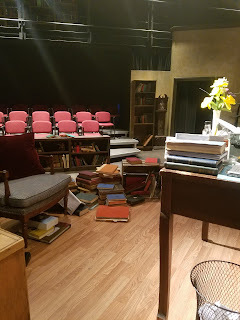 Because the play spans over such a long time frame, I couldn’t use books from one particular decade. All of the books from Act I are published before 1940 (with several being published before 1900), while the Act II books are from the 1950s or 60s. To make it more tricky, several of the books needed to be duplicated to gave the illusion of Frank “sending” the book to Helene. Finding a specific old book can be a challenge; finding two identical copies was even tougher. My biggest source for locating all these books was ThriftBooks.com, but I relied on eBay, Amazon and antique stores as well. On average, I spent about $12 per book. Although some were as little as $4, others--the really specific ones that we absolutely had to have--were $30-35. 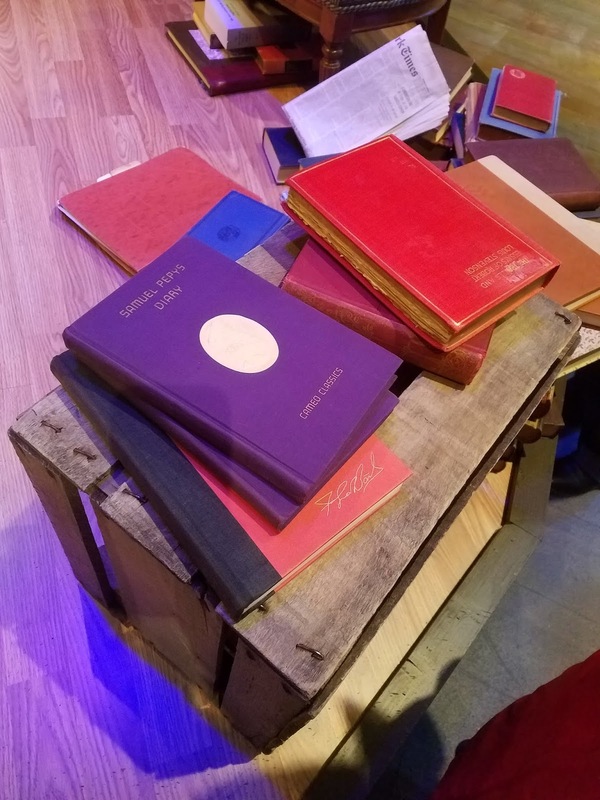 Sometimes the script was very specific about which books were needed, like with the Oxford Book of English Verse, with its “original blue cover.” Other books had to be a certain size, while others required gold leaf on the pages. I did my absolute best to find books that fit the description. Sometimes I couldn’t find a title, and on those occasions, I used old book covers to cover modern books. But 70 percent of the books mentioned by name during the production are copies of the actual titles and are from the appropriate time period. My favorite book is the small red, gold-leafed book of poetry, which is given to Helene from the Marks and Co. staff. It’s actually a book of Robert Browning’s work, which I purchased three years ago when I visited Charing Cross Road. While Marks and Co. is, sadly, long gone, there are many bookstores along that street and this book was purchased at Quinto’s, 72 Charing Cross Rd. After the books were taken care of, I turned to the dozens of letters that are written during this extraordinary correspondence. 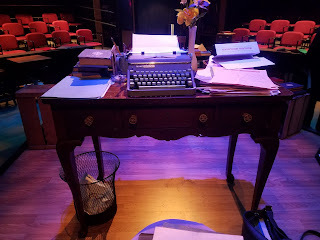 In our intimate black box, and in a theatre-in-the-round setting, we couldn’t fake those letters. 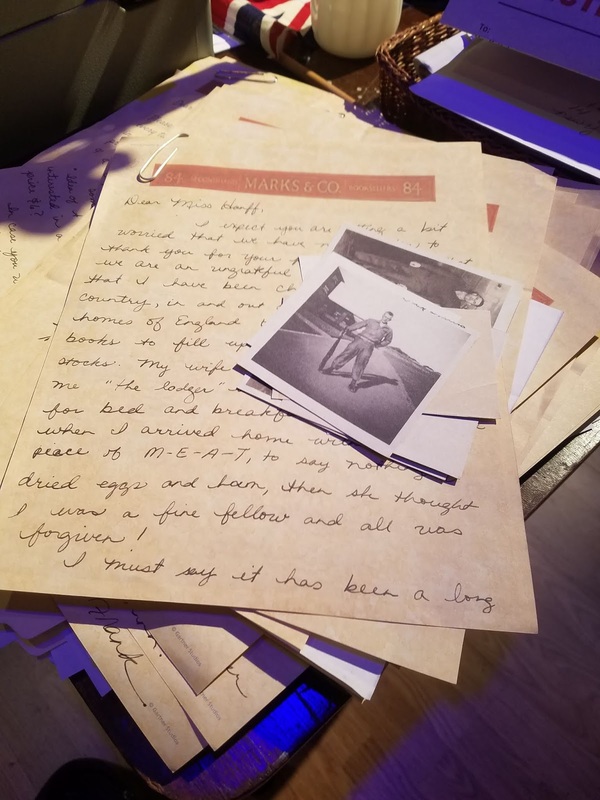 So I typed all of Helene’s letters, and hand wrote all of Frank’s using a fountain pen. 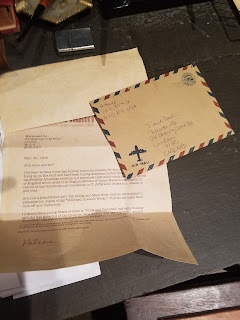 I found handwritten letters online from both Helene and Frank, and tried to copy their handwriting as much as I could. Helene’s letterhead was created using a stock picture of a 1940s-era fountain pen. When Helene moves to a different apartment in New York, the letterhead changes as well; it changes into Helene Hanff’s actual letterhead. (Thank you, Google!) I created the Marks and Co. letterhead by taking a picture of the storefront, cropping it down until you only had the “Marks and Co” part, and then tweaking it in various photo editing programs to make it more crisp and colorful. 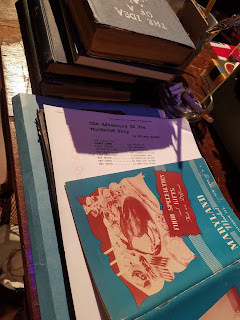 Every “Marks & Co.” bookseller uses the stationery throughout the show. 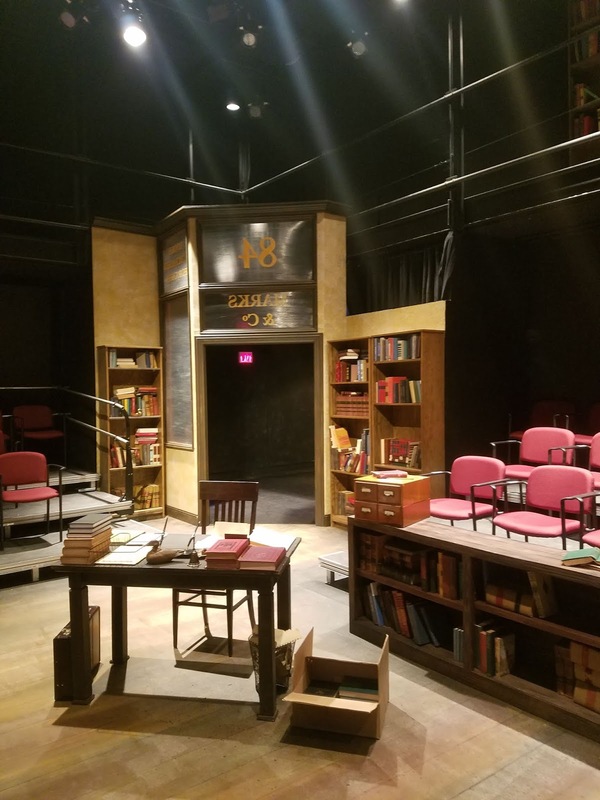 Doing “just” the books and letters was nearly a full-time job, but it was absolutely the least I could do to complement the extraordinary talent of the cast and the superb set design. Did I mention the superb set design? As an audience member you will smell the old books (thanks to a diffuser emitting “old book smells”) before you see them, and you will be greeted by a glass window storefront announcing your arrival at 84, Charing Cross Road. Walk through the doorway, and you will find yourself in a bookstore seemingly brought back to life. You’ll never forget your trip to 84, Charing Cross Road. The Oxford Book of English Verse, 1924. 84 Charing Cross Road, 1970. Thank you, Heather! Such a lovely labor of love!